ISRA University Hospital Hyderabad Sindh. 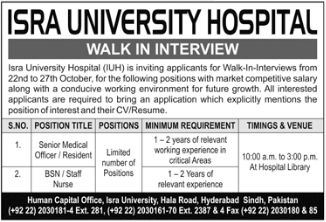 ISRA University Hospital (IUH) is inviting applicants for walk-In-Interviews from 22nd to 27th October for the following positions with market competitive salary along with a conducive working environment for the future growth. All interested applicants are required to bring an application which explicitly mentions the position of interest and their CV/Resume.